This is a book review I wrote for the microfinance news site microDINERO about Hugh Sinclair’s controversial new insider/whistleblower account of the microfinance industry. Hugh Sinclair, 2012: Confessions of a Microfinance Heretic: How Microlending Lost Its Way and Betrayed the Poor. San Francisco, CA: Berrett-Koehler Publishers. Outside of the mainstream and microfinance’s promotional campaigns, many academics, NGOs, critical journalists and also former microfinanciers have quietly criticised microfinance for years – only to be ignored or dismissed as lunatics or ideologues. 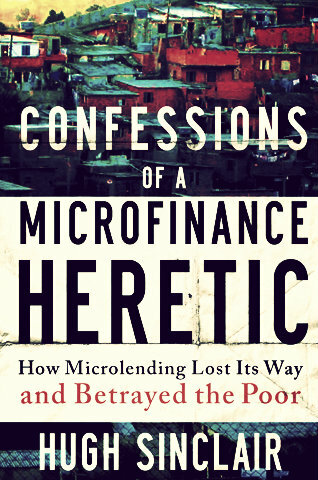 The problems in microfinance, however, are very real, and Hugh Sinclair’s controversial new book “Confessions of a Microfinance Heretic” makes them impossible to ignore. For the few independent researchers, fortunately able to study microfinance without reporting to microfinance-supporting bodies or the major research groups (which happen to be mostly funded by the same organisations which fund microfinance), the problems of microfinance are not news. They include that microfinance, by its very nature, supports only the simplest, least-productive and lowest growth-potential activities, as Milford Bateman argues. They also include the fact that most loans are simply used for consumption, which even CGAP recognises in its attempts to redefine microfinance in terms of “financial inclusion”, ignoring the problem of these loans’ unsustainability. This is linked to the risk of overindebtedness and debt traps researched bravely by Jessica Schicks, and evidenced most gruesomely in the Indian microfinance crisis. There is also the problem of microfinance building on and employing immense power asymmetries, particularly between men and women, as Lamia Karim has shown, rather than removing these asymmetries through actual processes of empowerment. These are just a few issues. With Hugh Sinclair along comes someone who has extensive real-life experience, a fascinating story to tell – from his original belief in microfinance to his disillusionment and ultimate heresy against it – and a knack for writing. His book, as devastating as it is entertaining to read, presents a serious challenge to large elements of the microfinance industry. Sinclair adds a new problem to the list of reasons why microfinance cannot keep its promise of poverty reduction, showing that the incentives within the microfinance industry are structured in such a way that positive developmental outcomes can – at best – occur as an accidental by-product; and mostly won’t occur at all. Let us call this the “problem of industry structure” and investigate it. To begin with, contrary to many other critics, Sinclair assumes that the interests of the people at both ends of the microfinancial chain are actually aligned: that is, both the funders and the borrowers of microfinance loans actually want the loans to relieve the poverty of the borrowers. Be that as it may; in between the two sits a microfinance industry which controls the flows of both capital and information. To simplify, this industry consists of two types of actors – MFIs (microfinance institutions) and funds – whose interest is usually to lend or invest money at the highest possible rate of return. For the MFIs, the only source of revenue are the clients who pay interest (and often deliberately-hidden fees, as Sinclair alleges) on their loans. Rather than engage in costly screening of clients, it is easier for MFIs to charge excessive interest rates to everyone, through which they can absorb any losses on bad loans. To this scheme Sinclair adds the typical practice of not writing off failing loans, indefinitely postponing default with replacement loans instead, plus a general incompetence among MFIs at making good choices. As a result of these, high rates are most MFIs’ only possible survival strategy. The second set of actors, the investment funds, need to find MFIs to invest in, which promise an assured return on their investment. For the fund’s own fees and for its investors’ tastes to be satisfied, this return need not be particularly high, but funds (just like MFIs) find it costly and difficult to screen for the right partners to give money to. Their easiest and safest option, therefore, is to give it to the MFI with the highest returns, and preferably one in which other funds have already invested (the herd-instinct), so that at the end at least some money is certainly left over for the fund and its investors. The losers in this scheme, according to Sinclair, are the poor people who pay excessive interest rates – with all the imaginable effects, from business failure to overindebtedness and worsened poverty – as well as and the original investors and donors, who are duped. The control of the industry over information about microfinance (from glossy photos essays to heartwarming client stories to pseudo-regulation initiatives like the SMART campaign) keeps the investors in the dark about the bizarre ground realities of microfinance. Sinclair’s main message therefore goes out to the investors and donors, warning them that they are being taken for chumps. No doubt, his book will be most vehemently opposed by the microfinance industry because it seeks to unsettle the industry’s truly most valuable stakeholder: not the poor (who do the work) but the rich who give the money, from the casual Kiva “investors” to the committed long-term donors. Sinclair isn’t saying that the entire idea of microfinance was wrong, nor that most people in the industry are in it to get filthy-rich (even though a few are getting so). Rather, his point is that the for-profit microfinance model, as promoted under the auspices of the Washington institutions IMF, World Bank and USAID, which was intended to make microfinance more efficient and pro-poor, is having the opposite effect. By assuming there to be no need for any real evidence-checking on social impact, because of course “the market will solve it” through competition and client choice, the for-profit microfinance model created a comfortable environment for fraud, greed, and incompetence. Others have launched more fundamental and principled critical investigations into microfinance, before Sinclair. Nonetheless, this insider-turned-whistleblower’s deeply personal account of how he realised that the industry he worked for committedly was unable to fulfil its promises may have a major impact on the public imagination of microfinance. How Sinclair realised that trying to reform microfinance from the inside via constructive criticism wasn’t working, because it ran against the interests of everyone involved (except the poor), is an enthralling tale which interested readers will find difficult to put away. The story of how microfinance has been hijacked by corrupt, greedy and callous actors whose finest skills are self-praise at lavish conferences, promoting their own business as a cure-all for poverty (against all evidence), and luring already-poor people into crippling debt traps presents a direct challenge to those actors. No doubt, those who fail to recognise this challenge as an opportunity for reflecting on the real mission of microfinance, rather than denying the lack of systematic evidence of microfinance’s beneficence (after 35 years! ), and refusing to root out the bad players, will be enraged. The others should take the opportunity seriously. “Confessions” is a thrilling and chilling read. But while the book makes a powerful argument, and is meticulously referenced, allowing the reader to do her or his own background check, it does remain opaque in a few places. The evidence of funds engaging in active cover-ups, rather than just being pitiably incompetent at their job, is insider material which remains difficult to corroborate with public-domain information. How exactly the funds reacted to Sinclair’s attempts at critique and reform is irrelevant, however, to the main point about the problem of industry structure in microfinance. This book is therefore most important for three reasons. First, it prompts a long-overdue questioning of whether the solution for poverty can actually be found in giving people more debt through an extension of Wall Street-style finance into the slums and villages of the Global South. Second, the book’s critique may help to root out the bad players in microfinance, for whom social impacts are mere advertising stratagems, while making a quick buck on the backs of poor people is the bottom line. Third and finally, it offers some actual solutions beyond rhetoric and promises. It’s easy to criticise critics, particularly those who see conspiracies everywhere, but they do play a role in the swinging pendulum of opinion. And Hugh is so right to remind us that MFIs are not the main providers of microfinance, unless we chose to define ‘microfinance’ by those who provide it rather than by what it is. Banks and credit unions provide microfinancial services to many more people than the 120 million or so who are served by the specialist MFIs. In particular, some 70 million women in India are served by the five mllion or so self-help groups (SHGs) which save with and borrow from commercial banks. The SHGs are not perfect, by any means, but the interest rates they charge their members, and which they pay the banks, are not excessive, indeed they are often too low because of misguided political interference. And ‘we’, who may have rather large mortgages and are rightly concerned about fractions of a percent differences in interest rates, often over-emphasise the importance of interest rates. Look at the website of ‘Qickquid’, a major British lender; I saw their poster advertising ‘ten minute money’ yesterday, proclaiming in large letters that their APR was 1790%; this does not stop their (mostly) literate British clients from using their services. Price is only one of the ‘4 P’s’ of marketing, and product, place and promotion may matter a lot more to some clients. Even in the late ’60s and early ’70s, when the apostles of microcredit made the ahistoric and fallacious argument that they had ‘proved’ that you could deliver financial services to poor people and make money doing it, and that the only viable source of funds to get billions of people out of poverty was the Western investor, they may well have known that they were wrong on both counts. If they didn’t, they certainly must know now. In earlier generations credit unions had helped millions of people out of poverty in dozens of emerging nations by delivering financial services to them, and had made money doing it. The source of their capital was just as sustainable, just as scalable, and far more providential: it was the very savings that poor people also needed to help them manage the risks of borrowing, and to anchor the process of building household assets. The failure to deliver microsavings to people whose lives involve far greater risks than most of us can imagine is a telling testament to how cavalierly the leaders of modern microcredit take their role as stewards of financial inclusion. In spite of widespread rhetoric to the contrary, no one should have the ‘right’ to borrow. Whether the loan comes from Wall Street or their neighbours, their character and previous track record should matter. But everyone should have the right to a safe, flexible place to save their money. That is what we should have delivered long ago, and it is not too late. I agree with you that Hugh Sinclair appears to have hit the nail smack on the head (of microfinance). He has very firmly and comprehensively exposed the real greed-based motives of so many of the most prestigious institutions and individuals working in the microfinance industry today and in the past. Some of the material is simply shocking. I really don’t see how the microfinance sector can once more pick itself up and recover, to be honest. It might indeed be ‘the end of microfinance’. But I also agree that Sinclair errs in resorting to the ‘happy ending’ that ‘some’ microfinance actually works. Why did he choose to do this? And, more to the point, where is the evidence for this? I mean, if he blasts others for not being upfront, then he should have given some evidence so that we can see what exactly this MFI he likes so much is doing to help the poor. Hugh: I’m sorry to say but yet again you are seriously muddled here, and not just with regard to my name. I simply don’t get the connection you make between me wanting to limit the damage caused by the channelling of scarce financial resources into microfinance applications and the point you make about having a bank account or not. The two things are totally seperate issues and you can have one without the other, or both, or neither. Microfinance is ‘not worth doing’, as you put it, among other things because it impels local economies into a trajectory marked out by de-industrialisation, informalisation and infantilization. If you mainly channel resources in such a way as is suitable only for petty trade-based informal microenterprises, then that is exactly what you end up with. And upon such a base, there is simply no evidence from anywhere that a country or locality can grow and develop: the evidence is all around you in Africa, where I think you work, probably more than anywhere else. And the IDB in its excellent 2010 publication’ The Age of Productivity’ also makes exactly this argument for Latin America, that too much finance has gone into informal enterprises and self-employment ventures and not enough into much bigger formal enterprises, inclouding SMEs. As always, a very Nice Post Phil. For me, Hugh Sinclair’s book was a very interesting one that put forth a set of claims about the way funds and MIV’s operate etc etc and I am currently evaluating his (public domain) evidence dispassionately and objectively and also doing my own research and I will publish the results of the same shortly. Cheers and have a nice day! Regulation and Supervision of Micro-Finance Investment Vehicles: An Urgent Task for Central Banks and Regulators Globally! Triple Jump’s Response to Hugh Sinclair’s Book: Does It Raise More Questions than Provide Credible Answers? Self-employment is the only major source of jobs and incomes precisely in countries like Kenya where financial inclusion is also greatest. To argue that such small firms do not deserve access to credit is manifestly unjust. I agree that relatively bigger firms in these countries also have considerable difficulty obtaining credit. But they are the minority, and have better chance of obtaining credit from formal sources. All firms need credit really. In my view, the real problem is exploitation of the poor and not-so poor by the financial services providers. This is where we should focus our thoughts. whether for consumption or not, there is no good reason why the poor should not get credit.